Affordable Air Conditioning has almost three decades of experience helping South Orange County air conditioning customers meet their home . . . Affordable Air Conditioning and Heating is South Orange County's best value for professional, cost-competitive heating services . . . In addition to high quality heating and air conditioning services, Affordable Air Conditioning and Heating offers a full range of expert . . .
With over 30 years of experience serving local businesses, Affordable Air is South Orange County's best choice for commercial HVAC (heating . . .
As part of our comprehensive HVAC (heating, ventilation, and air conditioning) services, we provide high quality, cost-competitive . . .
For over 30 years, our full-service, family-owned HVAC (heating, ventilation, and air conditioning) company has provided thousands of residential and commercial clients with expert, affordable heating and air conditioning services. There's a reason we're called "Affordable Air Conditioning & Heating": we're South Orange County's best value for high quality air conditioning, heating, and ductwork services, including sales, installation/replacement, repair, and maintenance. Our services are a great value because we offer them at competitive prices, but they're also a great value because we provide the most cost-effective HVAC services in South Orange County, and our high quality work produces effective, lasting results. Whatever your HVAC needs may be, we can help. Our technicians have the experience necessary to provide fast, reliable service for any heating or air conditioning need, and they're trained to work with all air conditioning and heating systems, including the latest energy-efficient units and all the major brands. We provide expert, fast, affordable installations for air conditioners, furnaces/heaters, HVAC systems, and their accessories. Choose from our extensive inventory of options, including the top brands in the industry, all offered at the most competitive prices: Maytag, Bryant, Carrier, Coleman/Evcon, Day & Night, Honeywell, Rheem, Trane, York, and more. We're proud to carry the latest environmentally-friendly models with the best energy efficiency ratings, which will help you reduce your energy use and save on utility bills. We also offer a full range of affordable HVAC upgrades and accessories, including air purification systems, wireless thermostats, programmable thermostats, zone control systems, and more. We even perform free on-site estimates for residential and commercial HVAC installations and replacements. In addition to offering high-efficiency HVAC systems and installation services at affordable prices, we also offer repair and maintenance services that help your existing system run more efficiently and effectively. It's our mission to help Orange County HVAC customers get the most out of their heating and air conditioning systems in a cost-effective way, and our repair and maintenance services are no exception. Our repairs are so effective that in addition to restoring your heating or cooling system to peak performance, they'll also save you money by preventing the need for future repairs or whole system replacement. Our high quality maintenance services also help prevent the need for future repairs and replacement, and in addition, they help your heater/furnace or air conditioner run more efficiently, reducing your energy use and saving you money on utility costs. All our services are priced at flat rates, so you're charged the same amount for a service no matter how long it takes. 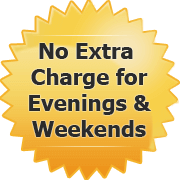 We provide evening and weekend appointment times at no extra charge, and we offer free upfront price estimates for all installations and replacements--the price on your estimate will not change. Call today to schedule a convenient service appointment or a free estimate for installation or replacement. We're happy to answer any questions you may have, and you're welcome to speak directly with owner Paul Gillon, who has been installing and repairing air conditioning and heating systems since 1985. Affordable Air Conditioning is a fully bonded, licensed, and insured company. When we make a service call to your home or office, we will assess the condition of your existing heating and/or air conditioning system at no additional cost.